Rotary Shaker/Bottle Shaker is a bench top orbital shaker designed to operate with or without timed procedures. The unit incorporates an ample universal & bottled shaking platform for handling large racks and reactions trays. The table top rotary shaker platform rotates in a horizontal plane and circumscribes ½ “diameter circle. This shaker allows a wide verity of rotating and mixing applications using tubes, flasks, bottles. The changing facilities are depending only one screw and there is no trouble for changing. 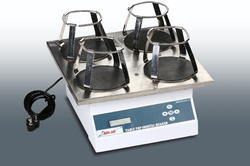 Looking for Laboratory Stirrers ?